A lot of people did a lot of desperate things when they were trapped in New York by Hydra’s Darkforce Dimension during Captain America’s failed bid to become a modern day dictator. It was a bleak time to be in the Big Apple, shut off from the rest of the wold and kept in check by an impenetrable shield and all manner of things that go bump in the night. And it turns out that the whole thing was overseen from ground zero by Baron Murdo, prison warden supreme, put in place to ensure that the city remained under the thumb by Steve Rogers and his Hydra lackeys. Yes sir, a lot of people were forced to do a lot of questionable things when Hydra moved into the White House and closed the gates on New York. And Stephen Strange was one of them. 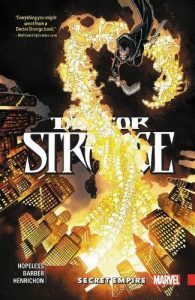 Displaced from his sanctum sanctorum by Murdo, Stephen is forced to go on the run to find a way of breaking through the Darkforce Dimension’s force field and along with Spider-Woman and Ben Urich, is propelled into a suspect and highly problematic alliance the Kingpin when their mutual interests collide. Sometimes though, the most unlikely allies provide the keys to hitherto unseen success and such is the case with Wilson Fisk, who having all of his oversized fingers in too many pies to count, comes up with a risky, incredibly dangerous and foolhardy plan to accomplish their collective goal. Which, of course, means that Stephen, Ben and Spider-Woman instantly agree and set about freeing New York and their fellow superheroes (who have fallen foul of their “keeper”) in a crazy, sorcery soaked scheme** involving all manner of mystical shenanigans, duplicity, double dealing, trickery and monsters most foul. And if that’s not enough to keep you entertained, following the whole harrowing, crush the Secret Empire storyline*, Doctor Strange also finds himself facing a murderous, forgotten foe from the past and in an expedition to unearth magical artefacts, dealing with ancient entities and long hidden, and legendary***, magical warriors and heroes. **Not a spoiler. You all know how it ended by now.